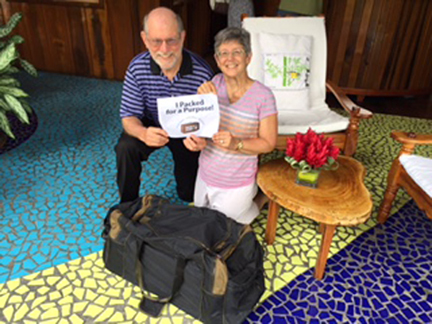 As a Board member of this amazing organization, I was thrilled to be able to “Pack for a Purpose” on a recent trip with my husband to St. Lucia. Although we were not staying at a participating lodging, The Landings St. Lucia graciously agreed to pick up the supplies we had brought for their project, Grow Well and the Gros Islet School. Other Board members had helped me gather a large assortment of school and art supplies–including everything from crayons, pencils, and markers to learning workbooks and games. It was all I could do to get everything in a large duffle bag. In the end, it weighed in at just under the 50 pound limit! Pack for a Purpose enabled me to meet specifically identified needs of a local charity, and in doing so, to experience the joy of giving back which every Pack for a Purpose traveler appreciates.